Wood blinds are a classic and naturally beautiful covering for your windows. The vibrant colors and organic textures of wood blinds lend timeless style to any home interior. Whether you choose a natural stain or a modern paint color, you will be sure to find the perfect wooden blind to complement your home décor. Depending on your lifestyle and the location you want the blinds to be in, it can determine which type you choose – Authentic wood blinds or faux wood blinds. To help you decide on the right wood window treatments for your home we have put together some important facts about the different types of wood blinds available. 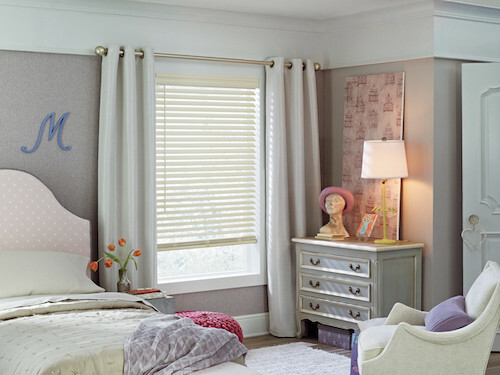 Hunter Douglas Parkland® Wood Blinds offer traditional styling with rich hardwood slats that complement the lines of any room. Created to provide a warm and inviting home with a classic flair. The advanced finishing technology offers maximum protection so your home will look beautiful for longer. Can you truly beat the natural beauty of hardwood? Hunter Douglas EverWood® Alternative Wood Blinds provide the classic look of real wood blinds with the convenience of modern-day materials. EverWood® Blinds won’t age, fade, yellow, warp or bow. 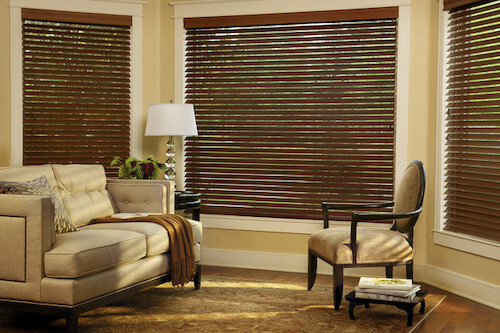 Faux wood blinds are ideal for humid rooms such as bathrooms and places with high sun exposure such as sunrooms. 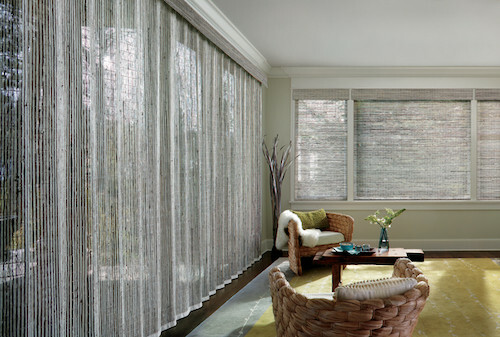 Hunter Douglas Provenance® Woven Wood Shades are different from traditional slat-style wood blinds. Crafted from natural woods, reeds, bamboo, and grasses, Provenance® Woven Wood Shades are also available in three distinct styles, Roman Shades, Waterfall Roman, and Vertical Drapery. If you are looking for a wood blind but don’t want the ridged slat style, consider the natural organic look of the Provenance® Woven Wood Shades. From textured fabrics to lighter more refined weaves, natural fibers make a beautiful addition to your home décor. Also available with room darkening liners that move independently from the shade, so that you can choose between light filtering into your home or blocking it out almost completely. 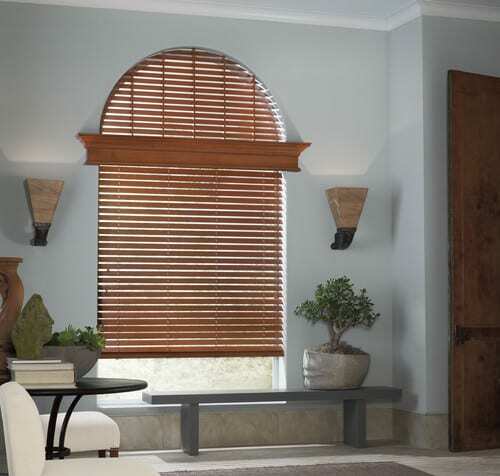 Learn more about the different types of Hunter Douglas wood blinds United Decorators offers. The Hunter Douglas Parkland® Wood Blinds Collection is brimming with a wide selection of paint colors and modern stains. Crafted from Abachi wood, the Abachi collection is originally creamy white or pale yellow with interlocking and straight grains. Stain colors vary from polished ivory and burlap sack to toffee and firewood. The Basswood collection has a broader range of colors from the darker tones of black, Tuscany and velvet rope, to warming shades of autumn gold, hickory, and cottage pine. Lighter hues of primrose, lamb’s wool, and eggshell are also available. You can peruse through sample books with every color and slat stain available at United Decorators. EverWood® Alternative Wood Blinds are available in realistic TruGrain® finishes or a large selection of solid colors. A wide variety of traditional colors and grains give the appearance of classic hardwood blinds, such as Brandywine, Antler, English Walnut, Classic Mahogany, and Dusted Truffle, Silver Birch, and many more. EverWood® Blinds also come in modern colors with less prominent grain lines, like Platinum Wash, Sahara, Arctic Snow Textures, Willow, Sea Salt, and Rockport Grey among many others. Combining your wood blinds with matching Parkland® wood cornices provides a finishing touch to your window treatment. Wood Blinds have hard, strong lines so pairing them with a cornice and light flowing custom drapery softens and completes the appearance. Cornices offer elegance and a measure of structural focus to your living space. Placing a cornice above a window frame attracts the eye upward, adding the appearance of increased height to a room. Which room do you want the blinds to go into; does it have high heat or humidity? What do you prefer, real hardwood or human-made materials? Which colors or stains will complement your home décor? The cost of wooden blinds is also a consideration. United Decorators has many budget-friendly options for your home or office space. United Decorators has dedicated interior design specialists on staff to help you make the right choice for your home and lifestyle. Create the look in your home that you have been dreaming of. 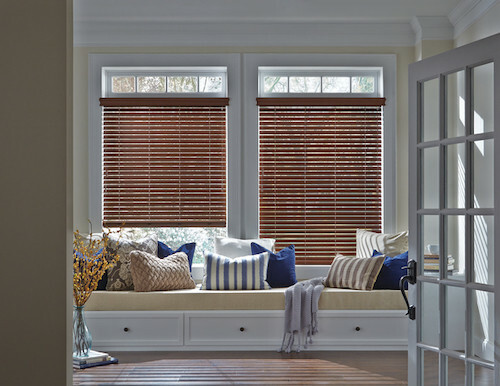 Coordinate your new wood blinds with custom bedding, custom drapery and furniture upholstery throughout your home. Having a professional guide you through the process makes it enjoyable and stress-free. Contact United Decorators today to schedule your free design consultation at 718.253.9300.